Mad Max, the latest action video game inspired by the post-apocalyptic universe of George Miller, has strong management options to make the life of the lone warrior least suffered in the Waste Land. All the game safe locations are known as strongholds. Stronghold is nothing more than a base structured, survivors who oppose the army of scabrous SCROTUS the son of Joe Immortan, the villain of the movie "Mad Max: Fury Road." 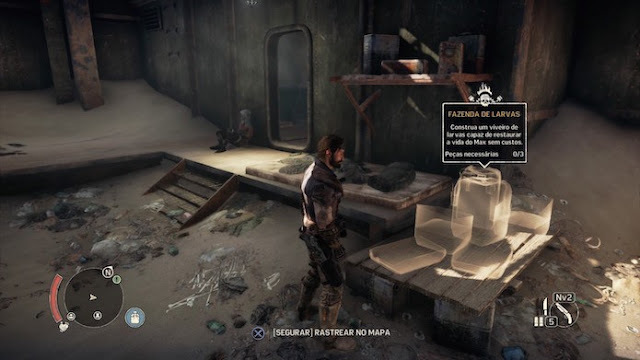 In this tutorial, we will show you how to improve the strengths of Mad Max. There are several strongholds around the vast world of Desolate Earth as Jeet Fort, located in Balefire Plain, Gutgash Fort in Parch Moon, Silo of Pink Eye and Deep Friah’s temple stronghold. They all become shelters for the protagonist and therefore can give raw materials for free, since some tasks are fulfilled by the hero. To get supplies without much effort, we need to complete the projects at a strong, providing necessary services and resources. When you open the map Desolate Earth and move the icon over the desired stronghold, the player can view the progress of their projects. To make a quick trip to the safe place, find accessory or material and track the required parts for strong design press "X" in the PS4, or "A" on Xbox One. In the image above, note that three parts are required to structure the maggots, able to restore the life of Max free of charge whenever he parked at the base. All parts required for the construction of a specific project can be tracked on the map. Each project icon is highlighted with a white circle around precisely to facilitate detection of the location on Desolate Earth. Besides Maggot Farms, Max is capable of developing several other projects in a fort. Among the options available, there are oil wells, restocking the Magnum Opus to automatically enter the base, work benches, in order to recharge the protagonist of ammunition arsenal, among others. An important tip is to try to fulfill all projects whenever a new stronghold is discovered, because then the character will not have to "farm" the essential resource continually survival.